Abstract: Agrobacterium sp. R259 is used in commercial production of beta-glucans for dietary supplements using bacterial fermentation / expression. Thus, the toxicity of this organism following production and purification, is of commercial interest. In this study, the 2,000 mg/kg body weight single dose toxicity of inactive Agrobacterium sp. 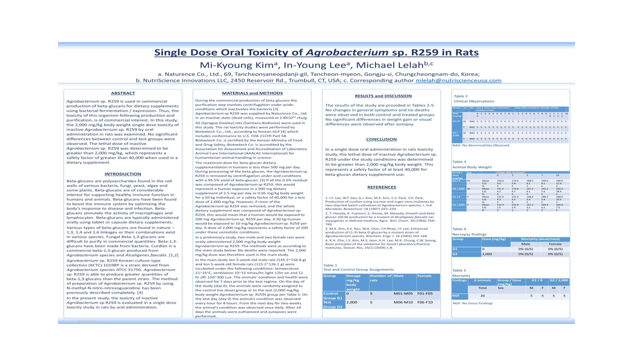 R259 by oral administration in rats was examined. No significant differences between control and test groups were observed. The lethal dose of inactive Agrobacterium sp. R259 was determined to be greater than 2,000 mg/kg, which represents a safety factor of greater than 40,000 when used in a dietary supplement. Summary: In a single dose oral administration in rats toxicity study, the lethal dose of inactive Agrobacterium sp. R259 under the study conditions was determined to be greater than 2,000 mg/kg body weight. This represents a safety factor of at least 40,000 for beta-glucan dietary supplement use. References: 1. I.Y. Lee, W.T. Seo, G.J. Kim, M.K. Kim, C.S. Park, Y.H. Park, Production of curdlan using sucrose and sugar cane molasses by two-step fed-batch cultivation of Agrobacteriurn species, J. Ind. Microbiol. Biotechnol. 18 (1997) 255–259. 2. T. Harada, K. Fujimori, S. Hirose, M. Masada, Growth and beta-glucan 10C3K production by a mutant of Alcaligenes faecalis var. myxogenes in defined medium, Agric. Biol. Chem. 30 (1966) 764–769. 3. M.K. Kim, K.E. Ryu, W.A. Choi, Y.H Rhee, I.Y. Lee, Enhanced production of (1-3) beta-D-glucan by a mutant strain of Agrobacterium species, Biochem. Engr. J. 16 (2003) 163-168. 4. K.H. Cho, J.S. Kim, M.S. Jeon, K.H. Lee, M.K. Chung, C.W. Soong, Basic principles of the validation for Good Laboratory Practice Institutes, Toxicol. Res. 25(1) (2009) 1-8.